The time of our Lord’s return is a debated topic that has continued for centuries. We have all heard the date-setters give one inaccurate prediction after another, and even a couple of "thus saith the LORD" thrown in here and there. The Christian Community has taken themselves completely out of the loop with the following mis-quote: “no man knoweth the day or the hour of the Lord’s return, not even the angels in heaven.” However, what the Lord really says in Matthew 24:35-36, is that heaven and earth will pass away but of that day and hour knoweth no man nor the angels. This is after the Lord’s return and after His thousand-year reign. So, are we supposed to know or not? ARE WE SUPPOSED TO KNOW WHEN? There is a multitude of verses concerning the Lord’s return and even an admonishment from Him saying, “Ye hypocrites, ye can discern the face of the sky and of the earth; but how is it that you do not discern this time?” That one verse should be proof enough that we should know, but He is not just going to plainly spell it out lest the wicked should understand. We also know there are NO idle words in the Word of God. If therefore, it is not meant for us to understand or know the time of His coming, would not’t all the verses with clues pertaining to the time of His return be counted as idle words? Here are only a few of many verses telling us that God will teach us all things; He will show us things that are to come which includes the return of His Son; And God says and He will show His servants things that must shortly be done. In Daniel, We are given a definite sequence of years that can now be understood. Just being able to understand things that have been a mystery for centuries should be a huge clue to us that time is short and approaching when all things will be finished. In the original Hebrew, Shabuwa is in plural form; meaning FeastS of Weeks rather than only one Feast of Weeks. This verse reads: “Seventy Shabuwas or Shavuots are determined.” Shavuot is one of the feasts call “The Feast of Weeks” ( known as Pentecost in the Christian churches). There is only one “Feast of Weeks” per year. To extend the clarity to the fullness of the verse, it literally reads, “Seventy Feasts of Weeks” (or 70 Yrs) are determined from some starting point unto God’s Rest. Now that we have verse 24 plotted correctly, we simply continue to the next verses in the Daniel sequence and plot all of them all to understand. *The Temple DOES NOT have to be completely rebuilt to fulfill Dan 9:27 prophecy. If a corner stone is set, the court can be measured to establish the location of the altar. Then, with the altar up and operating, this prophecy is satisfied. This was the same procedure used to rebuild the Temple in ancient times too. The walls were restored AFTER the altar was operating. Now that we have the whole Daniel “week” prophecies plotted in a chart form, all that is necessary now is to discern what the starting point is. Yeshua referred to Daniel concerning the latter days. He said when we see the abomination of spoken by Daniel, for those who are in Judea to flee into the mounts, for then shall be great tribulation. Matthew 24:20-21 But pray ye that your flight be not in the winter, neither on the sabbath day: For then shall be great tribulation such as was not since the beginning of the world to this time, no, nor ever shall be. Yeshua spoke of the fig tree parable and a generation that will not pass. Most everyone on this planet knows the fig tree is Israel. One generation is an average of 70 years not 40 years. The average age of those who were afraid to go to war and take the promise land was about 30yrs old; plus 40 more years for that generation to die in the wilderness equals 70 years. Matthew 24:32-34 Now learn a parable of the fig tree (Israel) When his branch is yet tender, and putteth forth leaves ye know that summer [is] nigh: So likewise ye, when ye shall see all these things, know that it is near, [even] at the doors. Verily I say unto you, This generation (ours) shall not pass (70 years), till all these things be fulfilled. Many times God works and speaks through His creation, prophets, and even enemies to perform His will. One perfect example is when God hardened Pharaoh’s heart that He might judge Egypt. He used Pharaoh that He might perform many miracles when He brought the children of Israel out with a high hand. It is no different today; God still works through any of His creation in which He chooses to perform His will. Just below is a special morning edition of the Eretz Israel - Palestine daily newspaper dated 11/30/1947 announcing the UN decision (Resolution #181) to establish a Jewish State bringing forth the BIRTH OF THE STATE OF ISRAEL. This is a very important historical document that bears record to the 100-fold fulfillment of Daniel 9:25, saying from the going forth of the commandment (the spoken word not 1948) to restore Jerusalem, unto the Messiah, shall be 7wks 3score and 2wks (69yrs); and also the parable of the fig tree spoken of by our Lord in Mat. 24:32-34 saying this generation will not pass till all be fulfilled. To illustrate another example, we turn to Ezekiel. He was commanded by God to lie on his side for 390 days (one day for each year pertaining to the exile of Israel). God said He would give Israel 7 times punishment if they refused to obey. This gives a total of 2730 years (390 x 7). Israel was carried away captive to Assyria in 720 BCE. From 720 BCE, to 2730 years later brings us right back to the year 2010 as shown on the Daniel's Timeline. Consider the Jubilee years (one Jubilee = 50 yrs). God said in Genesis that He would not strive with man forever because he is yet flesh, saying that man’s days shall be 120 years. (One Jubilee X 120 Jubilees = 6000 years). From Adam (around 4000BC) to the present day (2000 AD) also equals 6000 years. God told us in Psalms and in Peter that one day is as 1000-yrs. 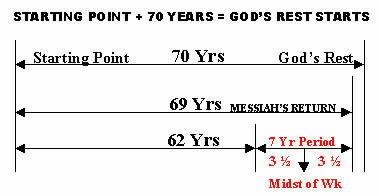 God creating everything in six days and resting on the seventh day, it is the same as to say, after six-1000 year days (or 6000yrs), He will also rest on the 7th-1000 year day (1000yrs), called the Millennium Rest. The last three Jubilees were: 1867 (The final emancipation of the Jews in Austria and Hungry), 1917 (The 400 yr Ottoman rule ended - Balfour Declaration), and 1967 (The Six Day War - Jerusalem was re-united); It's pretty easy to figure out the next Jubilee year (1967 + 50yrs = 2017). 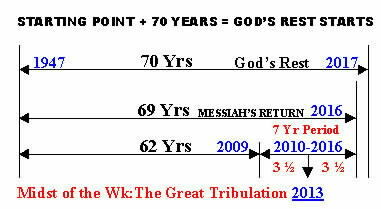 We are at this threshold today, approaching the 120 th Jubilee year (6000 yrs), the time of the restitution of all things. This report is only the tip of the iceberg . All of the information, the understanding, and the years are freely given. In addition to this, if you would like watch the full 2 hour Daniel's Timeline Presentation, you can watch it in its entirety by clicking on this link: Watch DANIEL'S TIMELINE Presentation - - - on line It will start automatically. It can also be seen on Youtube and Google video (just do a simple word search). All of these are completely free at no cost whatsoever. There is so much prophetic evidence that it takes 2-hours just to go through it all, from the the jubilees, the date the vision of Rev. 12 occurs over Jerusalem, the real serpent constellation (not Draco), the actual counting of days, finding the Sabbath and the first Passover through the manna instruction week, the fig tree nation, how the Feasts of the LORD confirms and ties all of this together, and much more. Surely no one could have put all of this together except that it must have seemed pleasing in God’s sight to show His people in these latter days. When God reveals His truth, all the prophecy pieces just fall into place on their own! Hosea 4:6 My people are destroyed for lack of knowledge.. Please Read This Attachment Note About "The Rapture"
This site clearly displays the tribulation years. The pre-tribbers will say, "OK, no problem, I'm gonna be raptured out here before all the trouble starts." The post-tribbers will say, "we have X amount of years left to prepare." Now, here is the dilemma: Both can't be right. If there is a rapture before tribulation, fine, we'll all get raptured out of here together both the pre-tribbers and the post-tribbers. But, what on earth will we do if the post-tribbers are right and we go throught the Great Tribulation?? We will all know for sure when we see the abomination spoken of by Daniel the prophet stand in the Holy place. If we see it on our T.V. the post tribbers were right. Remembering the parable of the 10 Virgins (5 were wise and prepared and 5 were foolish who did not prepare), maybe a little personal research should be done rather than just taking for granted what we have been told all these years. It is a known fact, and anyone can check this out for themselves, there was no such thing heard of as a "secret rapture" before 1830 untill a teenage Scottish girl, named Margaret McDonald, stood up one Sunday in the "Church of Scotland" and told of a dream she had claiming that the Lord would come back, not once but twice: first in secret before the tribulation starts to get all the believers; and then for a second time after tribulation. This spread like a grass fire with the help of Edward Irving (Minister of the Church of Scotland until he was dismissed in 1832, only to form the Catholic Apostolic Church) and with the help of John Darby (a pioneer of the Plymouth Brethren). Today the pre-tribulation rapture it is accepted as the absolute undisputed truth in most, if not all, of the Christian Community, who most likely do not even know the truth about its origin. Again, check it out for yourself. Is it better to believe what you are told that somebody heard that somebody else said, not bothering to check it out; or is it better to search it out for ourselves in the "Word of God" and then believe what the "Word of God" says? To read the scripture verses for yourself that are used claiming a pre-trib rapture go to the article called "The Rapture - Pre or Post Tribulation" or click on the icon below. This article covers a multitude of scriptures concerning the what, where, and when. To email a direct link from our site to any of your friends or family, simply right click on the menorah and click copy; then just paste the menorah in any the emails you are sending. It will bring them straight to Daniel's Timeline.